(P1) Computing giant Hewlett-Packard is close to breaking itself into two companies after CEO Meg Whitman ran out of options to turn around a business that is saddled with declining operations. (P2) The decision to split itself in two, which could be announced as early as Monday, follows a months-long process to explore the sale of several business units, including its PC and enterprise services unit to no avail. The belief is that by splitting in two, both could pursue sales or acquisitions with a simpler balance sheet, which was an issue that sources said had scuttled a plan to buy EMC. 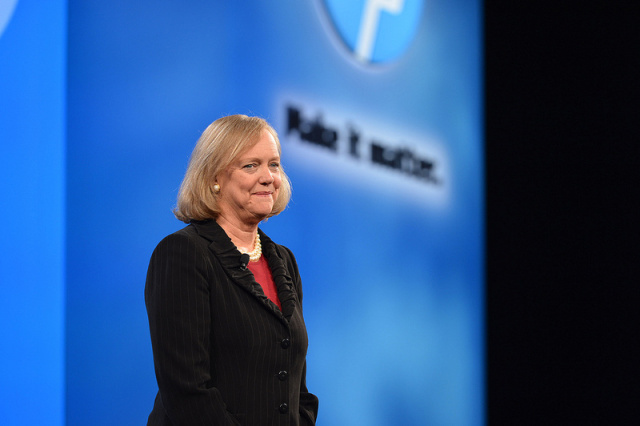 (P3) The move comes as Whitman begins her third year as HP’s CEO, and past the mid-way point of what she has described as a roughly five-year process to turn the company around with no revenue growth to show for. (P4) Instead, HP will break into two — one comprised of its personal computers and printers divisions and another to house its corporate computing and IT services — sources briefed on the plan tell Re/code. HP will likely discuss the plan in detail at a meeting with financial analysts in San Jose, Calif. on Wednesday. (P5) An HP spokeswoman declined to comment. The plan was first reported by The Wall Street Journal on Sunday. (P6) Whitman will be head up of the enterprise IT company, and will be chairman of the PC and printing company. Dion Weisler, head HP’s printing and PC group, will be CEO of that company and Patricia Russo, an HP director, will be chairman, these sources said. The transaction will be structured as a distribution of shares to current HP shareholders. (P7) The decision comes after a failed attempt at what it called “asset optimization,” an exercise led by Morgan Stanley to help it find buyers of units that it no longer saw as core to its strategy of expanding the selling of computing hardware, software and services to large companies. (P8) HP approached both Lenovo and Dell about the possible sale of its $32 billion (2013 sales) PC operation. In both cases it was rebuffed. (P9) In another case, HP approached two India-based companies, Wipro and Infosys about the possible sale of its $28 billion IT services unit, known as Enterprise Services. Again it was rebuffed. (P10) In a third case, it approached IBM about the sales of its $1.2 billion Business Critical Server business, but was turned down. (P11) It’s unclear how far HP got in talks with any of these outside companies, or whether or not they reached a formal phase. (P12) HP also recently explored a strategic merger with data storage company EMC that would have created a $130 billion technology giant. In contemplating that proposed merger, HP was interested most in VMWare, the cloud software company which EMC controls. (P13) The merger talks failed mainly because EMC wanted a higher valuation than HP was willing to pay. One other reason the talks may have failed was that HP and EMC viewed the declining PC and printer divisions as a drag on the combined operations, sources say. A split into two companies might set up a scenario down the road where HP and EMC re-open those merger talks combining the enterprise company with EMC. (P14) The move would be a modified version of a strategic plan that HP’s prior CEO Léo Apotheker proposed in 2011, but which Whitman shelved after she took over as CEO in September of that year. (P15) Apotheker, a former co-CEO of the business software company SAP, had sought to jettison HP’s PC business and transform the company into one more devoted to software. The lynchpin of this plan was the $10 billion acquisition of the British software firm Autonomy. HP has since conceded that it overpaid for Autonomy by about $5 billion. HP’s board fired Apotheker in the wake of that deal and tapped Whitman as CEO. (P18) Once the global leader of the personal computer business, following its combination with Compaq Computer in 2002, HP has since fallen behind China’s Lenovo into the number two spot in the PC market. Did you know that HP has made 110+ acquisitions since its inception in 1958? Many compare very competitive high-tech business as a war, and we are living through the time to witness IT dinosaurs faltering including HP and Microsoft. Watch closely how these big companies handle the difficult times, and the history might give you some wisdom of management for your own company someday. There are many questions ensuing the transaction such as ‘how much cash will HP put into the PC company (P16)?’ and ‘how will two companies deal with the loss in scale? (P17)?’ Why are those issues important for HP to address? What is your opinion on HP’s latest move? If you were a shareholder of the company, or a business analyst writing a report on HP, what would you have to say about HP’s next 5 years?